The popular build-and-survive video game Minecraft could very well be the most surprising tech success of this decade. Created in 2009 by programmer Markus “Notch” Persson, expanded by a small team, and advertised mostly by word of mouth, it now has more than 100 million users. To drive home its success, Microsoft bought the game a few months ago for a staggering $2.5 billion. I’m sure you’ve heard many kids, teens, and adults in your life talking about Minecraft. Here’s why that might be a good thing, and how to keep it from turning bad. I’m a huge fan of Lego. My son and I have spent hours building the model on the box and then taking it apart and making whatever else we wanted by rearranging the parts. 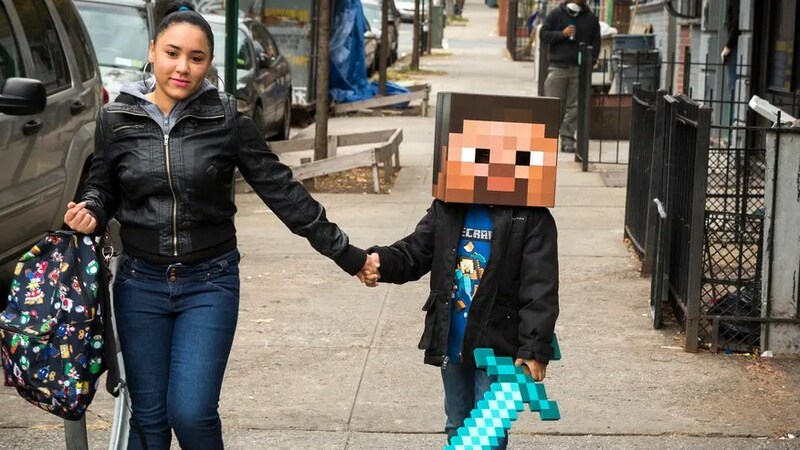 Minecraft gives kids the same creative freedom, but it’s easier on your bank account. Plus, you’ll never step on a loose piece barefoot in the dark. If you haven’t played or seen it, Minecraft is a very blocky world in that everything is built from blocks. The ground is made up of blocks, trees are blocks, and even your character avatar is very blocky. You get progress in the game by scavenging or mining blocks of various materials such as stone, wood, lava, etc. You use these as the basis for your creations, or combine them in “recipes” to create more advanced materials, tools and objects. There are also game modifications, or “mods,” that add more advanced items like robots, nuclear reactors, and a whole range of high-tech real-world materials. If you can think it, you can probably build it on Minecraft. Do you use that wood block now to upgrade your ax for mining, or save it for the house you’re building? Do you spend your time mining or exploring for new resources? Even if they don’t realize it, kids are learning cost-benefit analysis, such as when to save versus when to spend and other key budgeting and financial skills that are so important later on in life. Of course, they might need you to help them make this connection. Kids learn patience with Minecraft. It takes a while to assemble the resources you need, so instant gratification isn’t an option. Any adult who has ever saved up for a car or a house down payment knows that patience is important. Kids learn perseverance through the game. For instance, your child might not build that amazing monument correctly the first time it comes tumbling down under its own weight. They can learn how to recognize where they made mistakes and try again. Kids also learn about teamwork. While Minecraft can be played solo, it also has online options. Given that it is online, kids can play with others from around the world. They can team up and learn how to work cooperatively to make amazing things. That also builds pride in cooperation with others. Of course, they might also learn how to deal with people who don’t want to play nice. This is where parental monitoring is essential. If you want your child and friends to be able to play together, but not worry about strangers, you can set up a dedicated Minecraft server. It isn’t as hard as it sounds, and it lets you set the rules and who can play. Before your kid does anything online, however, whether it’s Minecraft, Facebook, or just basic browsing, have them read and sign my 10 Commandments for Kids Online. It’s a great starting place for speaking with kids about what is and isn’t acceptable online, and how to recognize dangers. Unlike high-end video games that only work on certain systems or require expensive hardware to run, Minecraft works just about anywhere. It runs on computers, smartphones and tablets, most video game consoles, several handheld gaming systems, and more. If you are handing your kid a gadget, there are a few things you need to do first. If it’s your gadget, learn how to let kids use your tablet or smartphone without messing up your settings or getting into things they shouldn’t. If they’re using their own personal gadgets, make sure you prepare it so they can’t get into anything online they shouldn’t. You should also install an app that lets you control when they can use the gadget so they’re forced to take breaks. Violence is a big complaint with video games. Sure, older video games were violent but the graphics were so cartoonish and crude it wasn’t the same as gunning down the highly detailed, lifelike characters found in modern games. Minecraft does have some fighting elements to it. You have to fend off “mobs” of monsters but the graphics are blocky and bloodless, like an old-school video game. For concerned parents of younger kids, Minecraft also features a “Peaceful” mode. This is the easiest setting and turns off all enemies. It also makes it nearly impossible to die, so you can just explore and build. I’m always a fan of parents playing video games with their kids. That way, you’re right there to monitor the game, teach them to be good sports, or shut it off when their time is up or when they start melting down. Plus, there are plenty of fun video games that you might genuinely enjoy. The LEGO series, for example, is very clever and not too difficult. The one bad thing: Minecraft isn’t all roses and sunlight. I already mentioned that playing online can lead to encounters with strangers who might not be that nice. The detailed replica of Denmark I mentioned at the beginning struggles with constant visits from spoilsport players who want to destroy it. Even worse than that, however, is that Minecraft like any other game or Internet service can become addictive. You might find that it’s all your kid wants to do. My son Ian and his friends talk about the game non-stop and I have to put strict limits and conditions on how long he can play each day. If you aren’t sure how long your child is spending playing Minecraft, the RescueTime program and app can tell you exactly where your child’s time is going. It might show there’s a problem you didn’t realize.